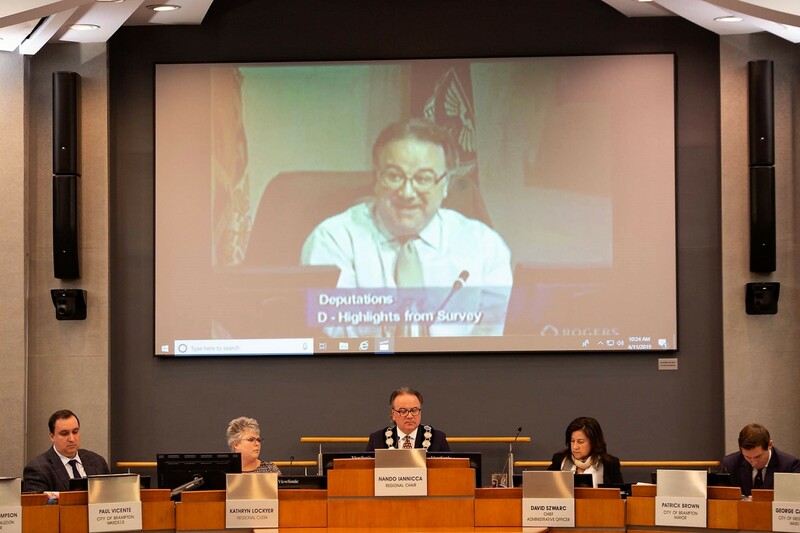 Bad blood flowed at Thursday’s Peel Region council meeting over competing visions of the future of regional government. Tensions have been simmering for months over Mississauga’s hopes to make a clean break from Peel, but they came to a boil in public, as the chair faced blistering accusations from members who, in true cinematic drama, accused him of selling out his city. Mississauga Councillor Carolyn Parrish, who, along with Mayor Bonnie Crombie, favours a “Mexit,” led the charge when she had the council chamber’s media people play video clips of Peel Chair Nando Iannicca, in his previous role as a Mississauga councillor, speaking in favour of dissolving the region. 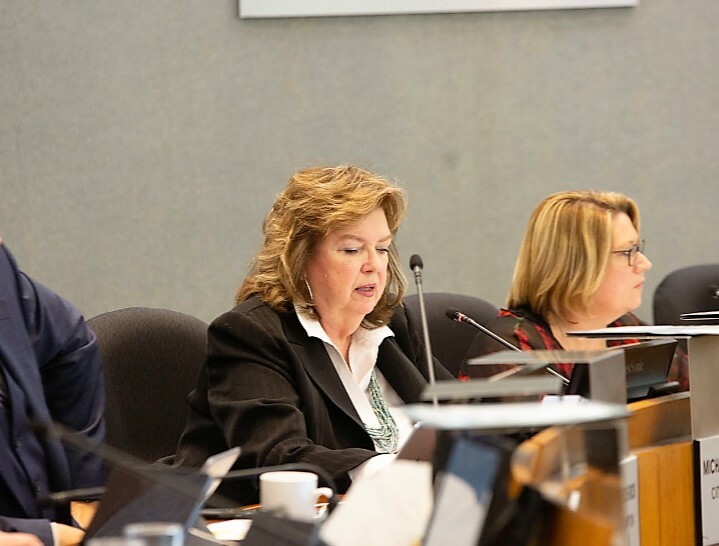 She was attempting to highlight apparent hypocrisy on the part of the chair, who has publicly stated in recent months that he believes Peel Region works well as it is. “You’ve reaffirmed what I’ve always thought, that we know the regional government never worked well for us,” says Iannicca in a clip from Oct. 30, 2013, that played on a large screen right above his head. It was a surreal scene inside a council chamber that felt more like a Shakespearean theatre for much of the morning. Iannicca acknowledged making the comments but argued the context has changed. “The record is the record, and I have to stand by that. 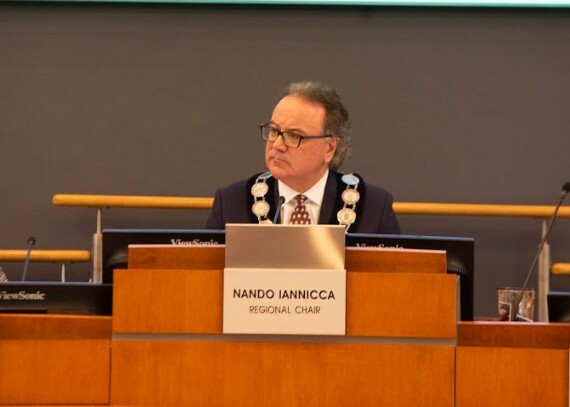 I want to remind you what we were talking about at the time was the governance model … we were talking about adding seats to Caledon,” Iannicca said. Councillor Martin Medeiros had interrupted mid-clip and asked that the debate continue rather than having the chamber sit through all of the videos Parrish had put together. “If the clips continued, you would have seen, outside of that particular discussion, there were three more positions that you took. They were rather strong and they were absolutely clearly opposed to the region and very much in favour of separation,” Parrish said. The sore point for Mississauga relates to documents the city’s separation-oriented councillors have found objectionable. Last month, it came to light that a so-called secret report by the consulting company Deloitte, commissioned by the region, showed that Mississauga would need to raise $1.1 million through tax levies initially to cover the costs of duplicating regional services as a single-tier system. “If Nando had shown any … leadership at all, he would have done this [commissioned the Deloitte report] in January. Why did it take till now?” Councillor Carolyn Parrish asked The Pointer. The province launched the regional governance review in January. 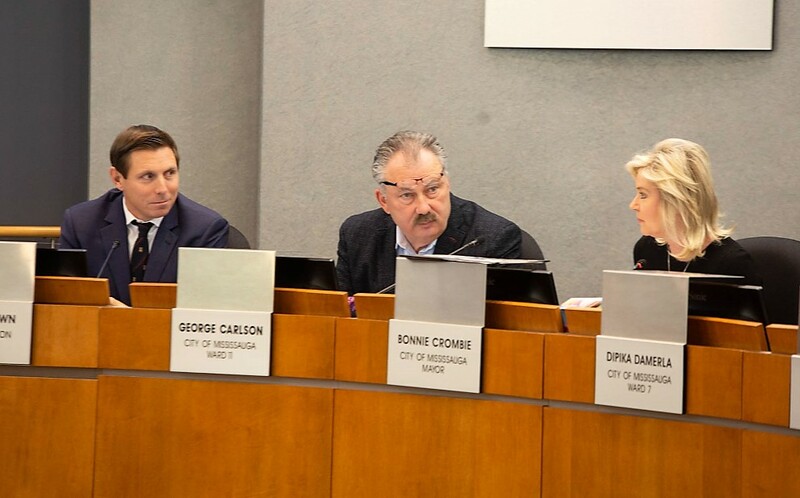 In the regional council chamber on Thursday, Crombie and Brampton Mayor Patrick Brown engaged in an argument, with Mississauga Councillor George Carlson awkwardly stuck between them; Carlson then moved his seat back to get out of the crossfire. Crombie took exception to the fact that she and her municipality had not been made aware of the Deloitte report and that Brown was able to get his hands on it before them. That sentiment was shared by other Mississauga councillors. Parrish put forward a motion asking Iannicca to “cease all activities, studies and public statements related to the provincial government review,” which was subsequently ruled out of order by legal staff and the city clerk, as dealing with higher governments is a major part of the chair’s role. Brown, visibly perplexed by the characterization, mouthed “immoral?” He responded by saying the report was not leaked to him, but rather that he requested information from the region through his staff and received the report as a result. “I heard claims out of Mississauga about financial analyses and numbers of what was owed to Mississauga and what Mississauga had been contributing, so I asked my staff at the City of Brampton to look everywhere they can to find what financial analyses back that up,” Brown told council. Included in the agenda of Thursday’s meeting was a testy exchange between Iannicca and Crombie that had been conducted over email. Crombie, on learning of the Deloitte report, had demanded to know the particulars of it, including scope, cost, and who authorized it. “To prepare for the governance review process, I asked the CAO to provide me with factual, unbiased information to better understand the financial implications of various scenarios,” Iannicca explained in his response, listing the cost of the Deloitte report as about $225,000, with a second, complimentary report by another firm as $100,000. The heated debate came to a close after Brown put forward a motion to direct the four CAOs of the region to come up with terms of reference for a new study looking into the financial impacts of dissolution. The motion also asked that an audit by an independent firm other than Deloitte — which serves as the region’s auditor — be used. Deloitte has been commissioned to produce reports for Peel in the past and councillors want fresh eyes on the issue. Ultimately, Thursday’s debate could end up a wasted exercise. Ultimately, under Ontario law, it’s the province’s prerogative to dissolve Peel, amalgamate its municipalities, or leave it as is. Premier Doug Ford could choose to ignore any study and revamp regional government according to his vision. “I hear Mississauga … They’re running around wanting their own city, and I don’t have any issues, and neither does our team,” Ford said in Burlington on Wednesday.